An appetite suppressant stimulates the adrenal glands and alters natural brain chemicals called neurotransmitters. They affect the brain function that is in charge of the feeling of being full and appetite. Cravings for food are lowered by muting the signal that a stomach sends to the brain when the stomach is empty. Appetite suppressants may also aid your body feel satiated by boosting the sense of relaxation, and that reduces unnecessary eating in order to be emotionally content. There are lots of all-natural appetite suppressant options to the prescription drugs on the market that are categorized as dietary supplements. 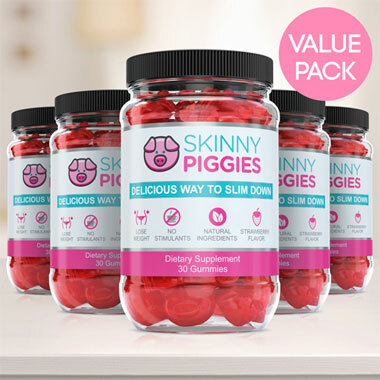 Skinny Piggies are yummy appetite suppressant gummies which contain all-natural compounds that have been demonstrated to lower appetite in a number of clinical studies. Do you like eating flavorful meals but also wish to burn fat? Losing body fat is all about maintaining a caloric deficit which means almost certainly you'll be hungry most of the time. Fortunately, now you can help your diet by savoring special, natural appetite suppressant, Skinny Piggies! These are irresistible fruit gummies that combat being hungry and sweet cravings while enabling your body to stay in weight loss mode. Before we discuss Skinny Piggies appetite suppressant gummies, let's take a look what is required for your body to start shedding fat. 3) A plan that is fun, so that you can stick with it for a long period of time. Sad to say, many diet plans skip one or more of the above items. To actually see good success with your regimen, it's critical that you eat fewer calories than you burn each day. You can possibly do that in one of two ways: increase your energy expenditure through added physical activity or lower your food intake. Doing both of these is recommended! If only weight loss was that easy! Even though cutting back on your daily calories can sound like a piece of cake, in fact your powerful cravings are likely to keep you pining after sugar snack the whole day. And that's where Skinny Piggies can help you. Skinny Piggies are fun, sweet healthy snacks you don't need to feel guilty about! Enjoy the yummy taste of these appetite suppressant gummies and let them do their magic. 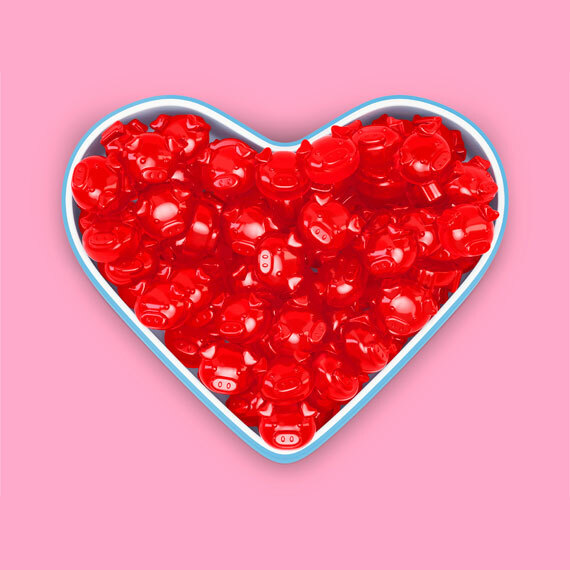 So, what exactly are the gummies doing for you? Appetite is for the most part controlled in two ways: caloric intake and the feeling of food in the stomach. After you eat food, your stomach fills up and the food stretches the stomach walls. That makes you feel full and you don't feel hungry anymore and stop eating. Eat a Skinny Piggy about 30 minutes before your lunch with a big glass of water. When the gummy supplement enters the stomach it absorbs the water and expands into a gentle gel. This gel then takes up space in the stomach and tells your brain that you just ate a good portion of food. After half hour you are ready to feast upon your food! At this moment, the gel is being very slowly digested and you are moderately full which means you will eat a smaller portion and still find yourself being full and satisfied. 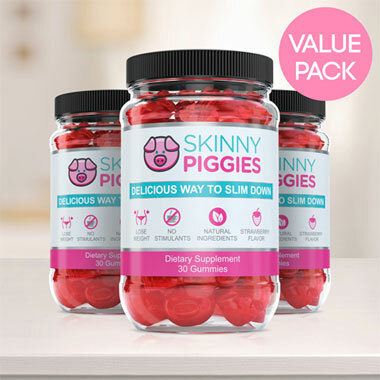 Have a Skinny Piggy gummy and you will end up eating fewer calories, reduce carb cravings and allow your body to be in fat burning mode . It means you can fight appetite and food cravings, hunger, and keep eating less, without seeming like you're on diet. The gel allows the stomach to empty much slower and that will make you feel full for a longer period. The sooner you are satisfied, the less likely you will continue eating and that allows you to achieve your weight-loss goals faster. As the viscous gel coats the food, it slows down the digestive function of sugars that flattens the level of blood sugar. By avoiding spikes in the blood glucose you avoid those intense sugar cravings too. Eliminating blood sugar spikes helps prevent food calories from getting stored as unwanted fat. By keeping you in fat loss mode, our appetite suppressant gummies help your body lose fat. Thereis no end to the choices of weight loss products being sold on the internet today. From weight-loss pills to hunger suppressants, it's not easy to find out what weight-loss supplement is right for you. No Harsh Stimulants: Taking a weight loss supplement without harsh caffeine means that you may take them even at bedtime, and our gentle formula means that the gel is OK with sensitive stomachs. Delicious Taste: Very few diet supplements actually taste good, and none have the same delicious taste of strawberries, that's why Skinny Piggies are a pre-meal snack you'll look forward to. Genuine Ingredients: Unlike other diet pills, it's actually easy to pronounce every ingredient in Skinny Piggy gummies, so rest assured that you're nourishing your body with the best ingredients. Well-balanced Ingredients: On top of helping you lose fat, they also support the growth of healthy nails and hair and help your skin look healthy. Losing body fat is not easy, but our product is ready to make the process more easy. You will like the flavor of our appetite suppressant gummies, so forgetting to take them will be a breeze. 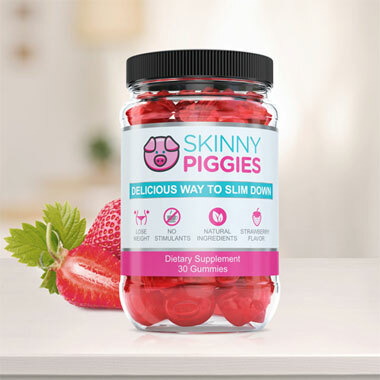 Simple to use and surprisingly satisfying, Skinny Piggies are supplement gummies that can help anyone.